Saturday was a blur! I attended and presented in my first Virtual Worlds Best Practices in Education Conference. For those who don’t know it, this is the third annual, two-day conference that takes place entirely in the virtual world of Second Life. It was quite an experience. 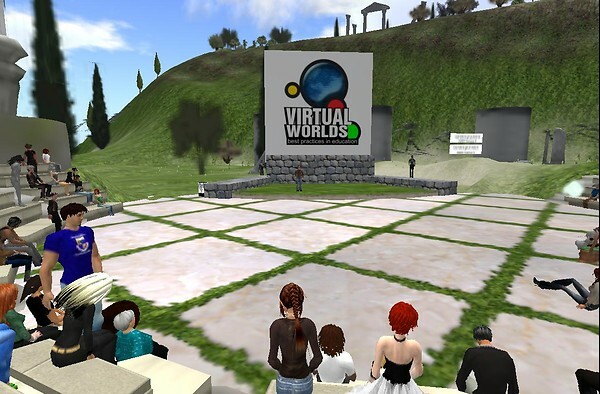 Educators, researchers, and academics from all over the globe attend, sharing their thoughts on how virtual collaborative environments (like SL) can be used to support teaching and learning. The presenters ranged from IBM to Linden Lab, from Japan to South America. And here’s the amazing thing – it was all free. There were no registration fees, no tuition, no cost. You just went to the VWBPE web site, clicked on a session that interested you to read the abstract and find the in-world location, opened up your Second Life viewer, and in you went. The conference is completely run by volunteers – I was so impressed with the long hours and hard work they obviously put into making this happen. And here’s the other amazing thing – at each event, workshop or talk I attended, I was surrounded by avatars from all over the world who shared my interests. There was a gold mine of information in the back chat. Opportunities for networking abounded. After checking their profiles, I exchanged contact information with scores of people who were working on or interested in similar projects. My colleague Liz Dorland (Chimera Cosmos in SL) and I gave a presentation – a “virtual first” for me. 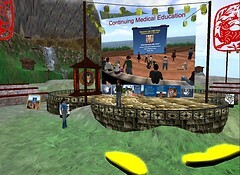 Our session was entitled, Learning in a Virtual World: Experience with Using Second Life for Medical Education. It was based on a Continuing Medical Education (CME) event that we designed, along with our colleagues John Wiecha and Elliot Sternthal, for family practice physicians and a subsequent article we published in the Journal for Medical Internet Research. Even though the preparation for giving the presentation took up valuable time that I could have spent listening to others, I was glad that we did it. As a result, I learned quite a bit about what’s involved in giving a presentation in the virtual world. First off, you have to figure out what you’re going to “do”. Note the verb there. Not what you’re going to “say”, but what you want to do. Liz, who is much more experienced in SL than I, suggested we come up with some activities, ways to involve our crowd in the thing. We tried a few things on for size – a magic wand tool she had that could make certain objects appear, shatter, swirl (she even has a device that can create a tornado!). In SL, as with all virtual worlds, the laws of physics and the rules of nature are suspended, so you can do all sorts of intriguing things to snag attention and hold it. With time pressure bearing down on us, we settled for a giant question mark that came down from the sky and the entrance of our mock patient avatars (from the CME event). Next we turned to what information we wanted to share and what information we wanted to glean from the avatars who would attend our session. We built a PowerPoint deck, which was mostly images (with a few supporting words). We converted the PPT slides to jpgs, so they could be imported into Second Life, and then transferred them to a media viewer, which could be controlled by my avatar. We both attended a “presenters workshop” given by the VWBPE organizers, in advance of the workshop, which was extremely helpful. They gave us a goodie bag full of useful items – notecards with presenting tips and techniques, slide viewers, media screens, translators, and HUDS (Heads Up Display). I didn’t have time to investigate all of the helpful tools and information they gave us, but I did figure out the Speak Easy HUD, which allows you to deliver pre-typed text into local chat, while you are presenting (as a device for the hearing impaired or anyone else who prefers their information come to them in the form of text, rather than voice). The conference ran 24 hours a day, taking full advantage of all time zones. I attended a few other sessions – most notably a good session on storytelling, the Metaverse Shakespeare company, corporate training, and a couple of good ones on educational trends in virtual worlds. It would have been helpful to have the agenda further in advance, so that I could have managed my time and adjusted my work schedule to match the conference, but I hate to even make that complaint, given the fact that the logistics were all done by volunteers! Our presentation was at 4:00pm (EST) on Saturday (you can view the recording here on Livestream – thanks, Tara!). Liz and I were practicing and figuring out logistics, right up until we went on. It’s interesting that in a virtual world presentation, you really have to stage it. Or “block it” – as they say in theater. We had to figure out where to place our pre-loaded media screen, where to place our notecard givers, where our avatars should stand, and what our camera angles should be. Quite different to a real life presentation. It turns out that our slot was right opposite some pretty famous folks, so we weren’t expecting much of a turn out. In the end, there were about 20 avatars there (a pleasant surprise! ), and they were a wonderful bunch. Good questions, lots of participation, and we made some great contacts. I enjoyed giving the presentation but found the multitasking involved a challenge – advancing the slides, following my notes, monitoring the back chat, making sure that voice was working, and working the Speak Easy HUD – all at the same time. In addition to all of that, I wanted to take a few snapshots (it would have been nice to record it, but we didn’t get around to that). Liz was working two computers – the second one allowed her to simultaneously bring in the mock patient avatar during the session. In hindsight, I wished that we had practiced more and taken deeper advantage of the unique Second Life affordances. I felt like I ended up talking too much (but I tried to weave a good story, following CogDog’s presentation advice). But, on the positive side, I now know what I’d want to do next time and can work on acquiring the skills for that. I also learned quite a bit from the people attending our little presentation (they gave us some really helpful suggestions about minimal skills required to be functional in SL and told us about other health & medical projects going on in world). And, as always, the collaboration between Liz and I was rewarding – and fun! It was a rich experience – and I did it all from my living room without spending a dime.